I have been pretty excited about getting started on the strake/plank layout and I finished up the cleanup of the last scarph joint last night so I got started at lunch today. 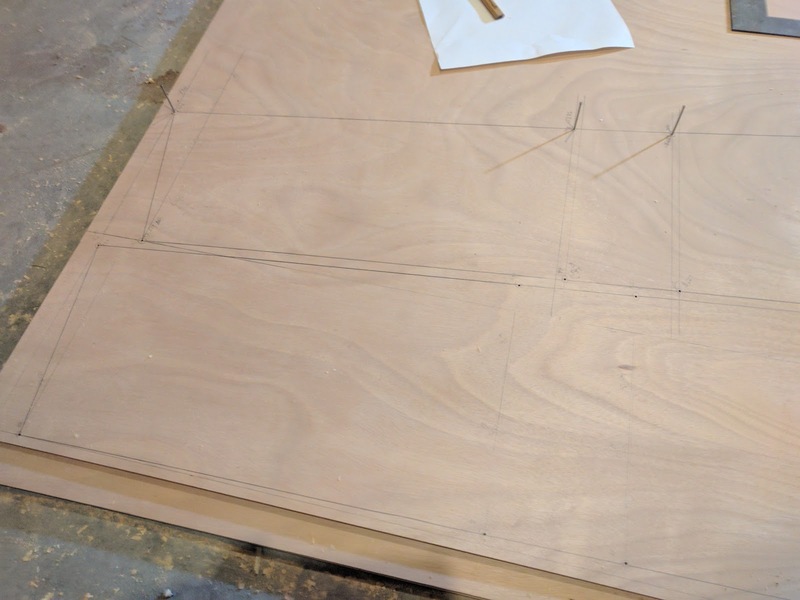 I spent a fair amount of time making sure I understood all the strake layout plans and how to transfer them to the plywood panels. Fortunately, Tom Dunderdale (the designer) did a great job of providing clear, concise strake plans in a number of forms. There is both an x-y coordinate sheet and a nicely illustrated version that marks the strake dimensions visually along the shape of the plank. I ended up using a combination of both, mainly because reading off the x-y coordinates is faster, but I double checked visually on the illustrated version. To get started, I had to setup a reference line to measure everything off. 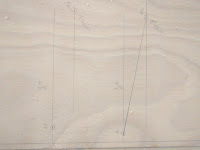 The illustrated plan showed an 8mm reference line along the bottom of the scarphed panel and all the first strake measurements are built from this line. Once I had that drawn the entire 16 foot panel, it was simply a matter of marking off the x-y coordinates for the top and bottom of the strake. 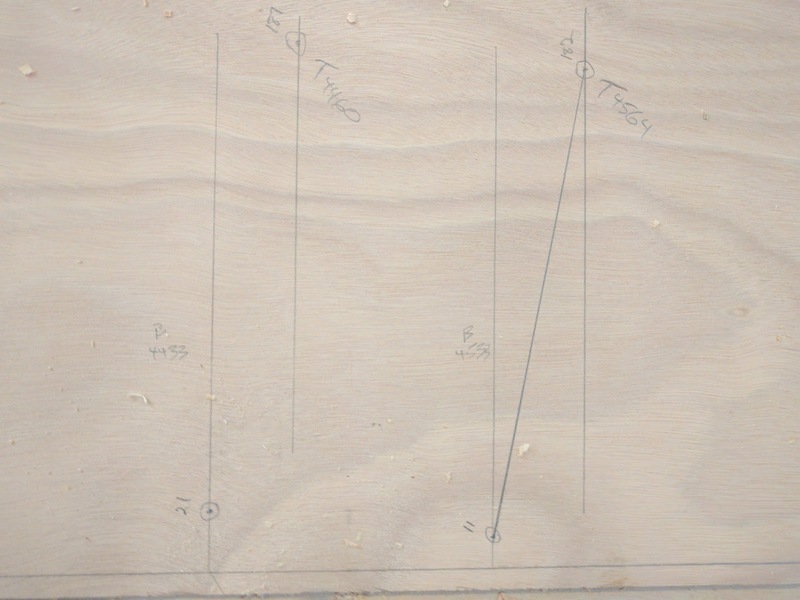 To make sure I could go back and double check measurements, I did all the x coordinate lines first and labeled each one before going back and doing the y coordinates. Pretty painstaking and monotonous work, especially considering there are x-y coordinates for both top and bottom lines of each strake. After completing all the coordinates for the first strake, I tacked finish nails into each coordinate and laid a wood batten on them and drew the curve. 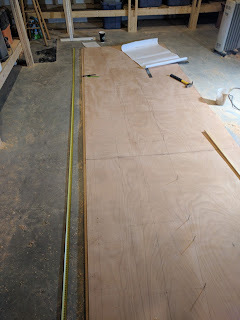 Very satisfying when you step back and see the strake's shape emerge from the plywood rectangle. Especially when it actually looks like what's on the plan. Between the monotony of marking out the strakes and being on my knees for 3 hours (yes it took about 3 hours), I only finished two strakes tonight. I think the rest will go a bit faster now that I have figured out a bit of a method, but it doesn't take long before the numbers start repeating in your head and mistakes are made. Towards the end I had to correct a few small dumb errors, so I figured I should quit while I was ahead. Marking the coordinates down on each point will make it easier to double check before I actually make the cuts when I get there. Nice to see how clear Mr. Dunderdale's plans are. Ha! Been there before with mixing up offset numbers, even after triple-checking everything. Ahem.. wound up with a 1/2 inch gap in the lower chine of an 8-fot pram that I built for my son... Epoxy gunk to the rescue!